Question for the mods, why am i not permitted to have a signature? its just a bit of scribble under my avatar? i know Tpishek and Gcar have them and i dont think they are mods so why wont it let me have one? They aren't signatures. They are custom titles. Custom titles are given out by [^_^] to those who are deserving, for example Gcar90 won the Cockshipping Fanfic contest a while back, and earned the title of her choosing. Tpishek doesn't have one. anyway what about signatures in general, howcome they do not work? Answered in the BAR. They're disabled because they are annoying as hell. You say that like there is a problem with anthros (Furries). Then again I have noticed alot of people seem to hate them. Still, I thought a furry was someone who dressed up in an animal costume while an Anthro was the name for the actual mostly animal/slightly human pictures. Alteast that's what I've always done to tell them apart. No. I don't have a problem with furries; I'm just not one. I was only clarifying what I was. Last edited by Fat1Fared; 04-04-2009 at 06:08 PM. Only Admins can give custom titles. I wonder why people keep confusing Mods with Admins? Thinking that Mods have the power to completely alter the site and Admins having only have the power to ban. Last edited by Fat1Fared; 04-04-2009 at 05:56 PM. Does that mean some ladybugs are grasshoppers? @Fared: It'd because even if all men are cats, you can still have plenty of cats that aren't men. Last edited by Fat1Fared; 04-04-2009 at 06:13 PM. Either way, it's the same. Well, there's different ways to interpret it. 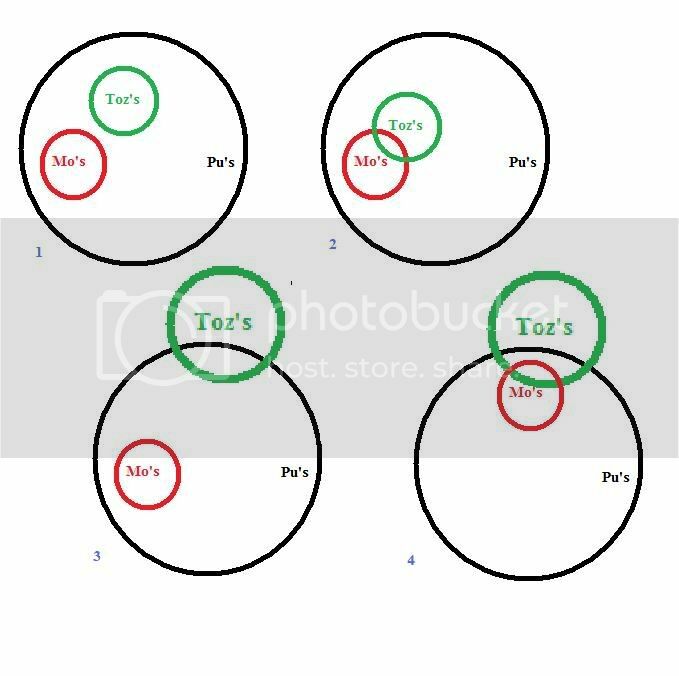 All four of these (hastily constructed) Venn diagrams satisfy the requirements of "all Mo's are Pu's and some Pu's are Tozs", but notice that as far as "Does that mean some Toz's are Mo's" goes, for 1 & 3 the answer is "no" and for 2 & 4 the answer is "yes." But my interpretation of "does that mean" is that if you can find a counterexample, aka 1 or 3, then the overall answer is No. Yeah, I was doing those in my head. You could also have the green circle entirely inside the red one, but it's highly unlikely. No, no. The men-cats DON'T have to be women, because SOME cats are women. They CAN be, but they don't HAVE to be. Yes, but if 100% of men are cats, that doesn't mean 100% of cats are men... so the % of cats that AREN'T men can be women.